What is Pi? Is there a pattern? I came across this interesting page where the author tried to turn Pi into an image using binary. Here is the 2D version. Is it a Fractal of sorts? The connection to 9th iteration begs the question, what about the 99 Sequences in Pi and the other patterns it holds?Some people have been trying to decipher pi, as if it is a cypher from God. Not only do people look for meaning in English, because of COURSE God would make his cypher in English–but Hebrew scholars look for meaning in Mathematical constants. Why do we search for meaning in Pi? For the simple reason that we expect intelligence at the base level of life. 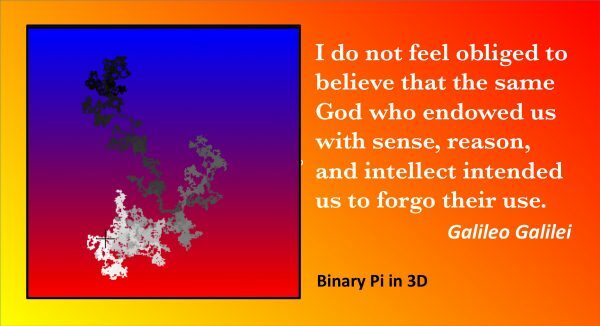 In a way, the hope that Pi contains a message or a pattern comes from our understanding that God is the author of Reason and Math. Galileo Galilei said that the Universe is written in the language of Mathematics. Most likely, the future holds some more secrets about Pi. Meanwhile, continue to pursue Math and Meaning in your pursuit of Truth.